Changing the world, one bed at a time. 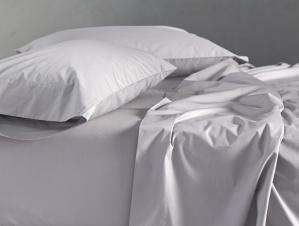 You’ll find beauty and exceptional caress in these sheets. Made from certified, organically grown cotton, this full-length 220 thread-count percale and flannel bedding will impress you with its natural opulence and satisfy you with its eco-friendly nature. No toxic bleaches, dyes or other chemicals are used in the production. Wonderfully crisp, yet soft on the skin, they’re perfect for warm nights—or warm sleepers. In addition to classic white and ivory, they come in a range of nature-inspired hues, washed back to look as soft as they feel. Comes 99% pre-shrunk. Flat sheet has a 4" self hem. Fitted sheet has a deep 15" pocket and full elastic around the bottom. Click here to check out the Coyuchi Organic Flannel Linens!